In the latter months of 2011, I toyed with the idea, like a lot of people reading this I imagine, of starting my own football blog. However, the focus of this blog would not be on the usual mixture of opinion on the pros and cons of a ‘false 9’, the intricacies of ‘tiki-taka’ football, the flaws of the England national team or the tedious transfer sagas that regularly engulf the summers months. No, my blog would be based on my very own personal football experiences. Having left my native South Wales and moved to Liverpool in 2010 and then Manchester a year later, I had begun watching my beloved Swansea City away from home more and more frequently. In the process, I gradually found the list of football grounds I had visited slowly increasing. 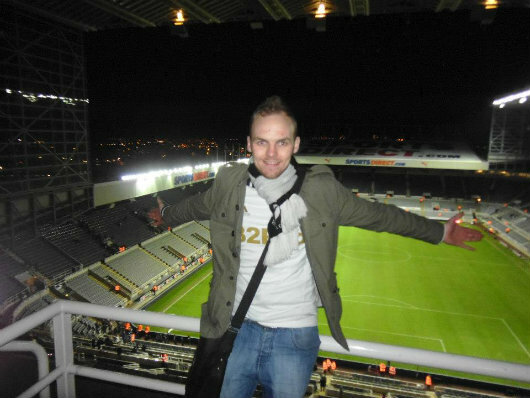 One day, en route to a Swansea City away day I decided to scribble down all the grounds I had visited so far – this was to be the beginning of an obsession: the chase to visit all 92 league clubs and their grounds. I’d somehow stumbled into becoming a ‘groundhopper’. On Christmas Eve 2011, with my South Korean-dwelling brother home for the festive period, we made the usual traditional trip to our local pub to celebrate the festive season. As the drinks flowed my brother, armed only with a Valleys-themed pun on a cult 1980s vampire film, pitched the idea of us starting a blog called Lost Boyos (for those that do not understand the pun, the vampire film is The Lost Boys starring Kiefer Sutherland and ‘Boyo’ is a term used by Welsh people to refer to one another – some people refer to a collection of Welsh people as ‘boyos’). 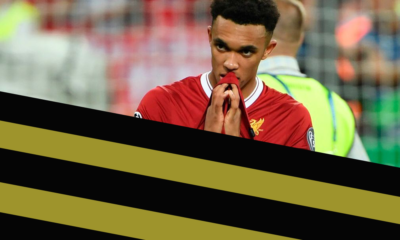 Playing on our pun, we decided that the main content of our blog would chronicle the adventures of Welsh footballers who had opted to play their football overseas. However, considering both of us now lived outside the borders of Wales, I pointed out that both of us are theoretically ‘Lost Boyos’ and that we could document our very own footballing travels and experience – me in the UK, him in South Korea and Asia. The groundhopping section of Lost Boyos was born. A typical Swansea away day. 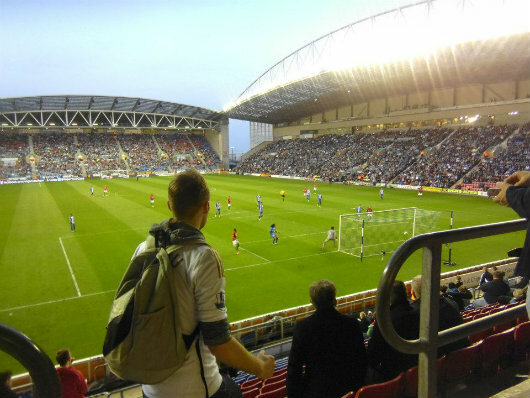 Me at the DW Stadium watching Angel Rangel bury a volley to equalise for the Swans. On moving to the North-West of England, watching Swansea City at home regularly became an impossible task. However, with my Swansea fix being gathered from the away day ventures with the club’s, my other Saturday was left vacant. The vacuum left by lack of attendance at Swansea’s Liberty Stadium was soon filled – more football. I began travelling to clubs in the Football League which were uncharted for myself and eventually I also fell in love with non-league football and began attending games in the darkest depths of the English football pyramid; in fact, whilst travelling to 71 games last season I actually attended a game at every tier of English football: from the Manchester League right up to the glittering heights of the Premier League. I regularly get asked “Are you mad?” when I head to places like Maine Road FC or Barnoldswick Town on a cold Tuesday night, but these sort of football clubs can be hidden gems and my fun can be had at places like Barnoldswick Town’s Silentnight Stadium (yes, it is really called that) than a lot of the Premier League grounds. So, what makes a good ground? I find people usually ask me about the ‘super stadiums’ around the country – “What’s the Emirates/Etihad/Wembley/Old Trafford (delete where appropriate) like?” To be honest, I love to visit all four of those stadiums, but a stadium does not achieve greatness by looking pretty and having a huge capacity. I regularly think to myself why do I like certain grounds more than others and I do appear to have a general ‘good ground’ criteria in my head – although this is certainly not set in stone. Generally, I find myself favouring the more ‘traditional’ grounds, largely because these grounds come with their own little quirks and idiosyncrasies. This is what I would say is one of the key factors for me to what makes a great football ground: quirks. 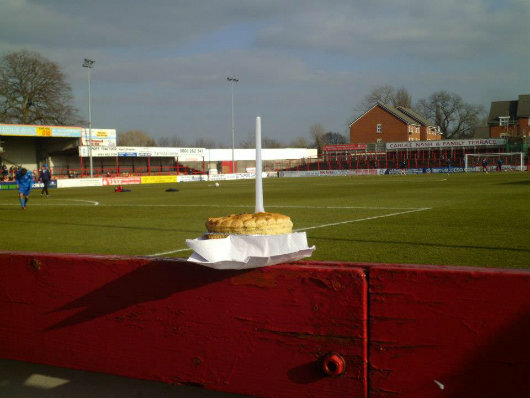 A ‘quirk’ could be anything that is out of the norm for your average football ground; a feature which really gives the ground its own individuality – whether this be an unusual stand or the ground being located in an interesting or unordinary place. I’m sure most groundhoppers would agree with me that the best grounds are the ones with distinctive characteristics. For example, unsurprisingly, I’m regularly asked what is my favourite ground that I have visited? My answer has remained the same for a long time now: “Craven Cottage” I always reply. Why? Well, Craven Cottage is as quirky and as full of character as they come, at least in league football anyway. 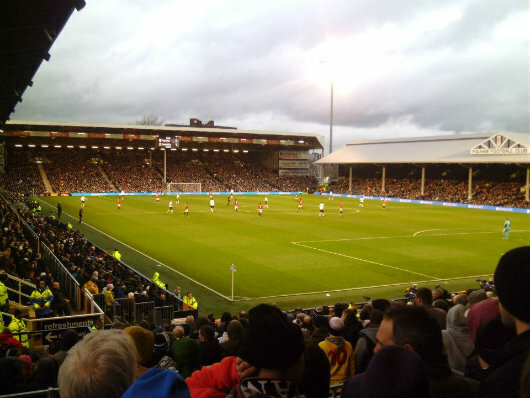 There are a whole host of anomalies to Fulham’s home: the ‘Cottage’ which sits in the corner of the ground (incidentally, not the cottage where the ground’s name comes from); the rickety old stands with wonder benches; the only ‘neutral area’ of any football ground in the country; the tree growing within the grounds of Craven Cottage and of course, not forgetting the bizarre, incongruous statue of the King of Pop, Michael Jackson. Craven Cottage also leads me nicely to the second part of my ‘what makes a good ground’ manifesto: the location. This is another reason why I adore Craven Cottage. Located in a nice part of West London, there is plenty to do (pubs to visit) before kick-off. However, the real highlight of the ground’s location comes when you enter the ground itself, as Fulham FC find themselves housed directly on the banks of the River Thames, meaning on a sunny day (or a cold, December afternoon like it was in my case), you can enjoy a pint whilst admiring the view of the Thames behind you. A ground gets a huge ‘thumbs up’ from me regarding its location. Unfortunately, many of the new built stadiums are located at soulless retail or industrial parks outside of town/city centres (I’m looking at the likes of Stoke, Leicester and sadly my club Swansea City amongst many others); this can hinder a ground visit massively. In regards to location, I cannot praise stadiums such as Newcastle’s St. James Park and the Millennium Stadium highly enough. Both are located directly at the heart of two of Britain’s most thriving and exciting cities; you could practically stumble out of a pub in Cardiff and fall onto the doorstep of the Millennium Stadium such is its proximity to the city centre. Non-league football excels in regards to ‘location’ as many grounds can be found in picturesque surroundings. I visited places clubs such as Glossop North End and Rochdale Town last season, both of which have stunning scenic backdrops to their football grounds. As you can imagine with this quite sad pursuit of ‘ticking off’ new football grounds, I also like the actual game of football – quite a lot actually – and initially I found the main joy of my tour was getting to see a whole host of players, particularly the real elite of world football since Swansea got promoted to the Premier League. A day at the football can be made by watching that one special player have the game of his life. Performance such as a 38-year old Jari Litmanen against Wales for Finland in 2009, where he barely broke stride, yet delivered one of the most magical displays I’ve ever witnessed with my own eyes, will live with me for a long time (the same applies to Gareth Bale and David Silva’s respective virtuoso performances against Swansea during our 2011/12 debut season in the Premier League – both truly breath-taking displays); yet as my footballing adventures have gone over the years, I’ve found that the people off the pitch can make a groundhop just as memorable – in fact, I’d argue that the characters you meet on your travels 9/10 make the day and the ground visit. To my mind it’s obviously not just about the football. I’m not one to go home after a match and ring a radio station or write a volley of abuse on a fans’ forum – I like to enjoy everything that surrounds a match, which normally involves a few drinks and a few hours of talking rhubarb. Since I started documenting my trips via Lost Boyos, I’ve noticed the format of my accounts change over time. 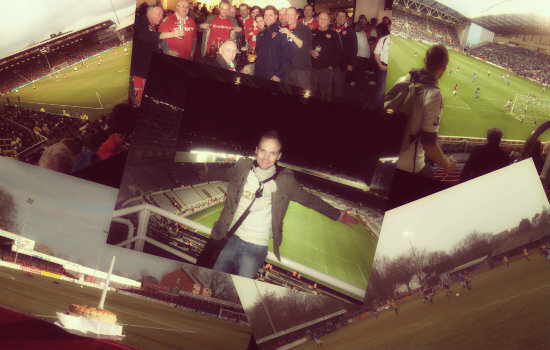 Originally, I envisaged the groundhopping section of our blog (the ‘Lost in…’ articles as we call them), being an almost glorified travel guide for football fans wanting to visit the grounds of the UK. Yet the more I chronicled my adventures, I found myself writing more and more about my personal experiences on the day and the characters who I encountered. The wonderful and wacky people you meet on a groundhop can make the day. Me and my friend Tom still joke that if I had started the blog a few seasons ago when we visited Scunthorope’s Glanford Park to watch Swansea City, I could have written a whole book just about the wide range of strange (but lovable) locals we met that day. I would even say that every time we’ve watched Swansea play away since, we’ve discussed that day in Scunthrope more than any other – the people made it memorable. 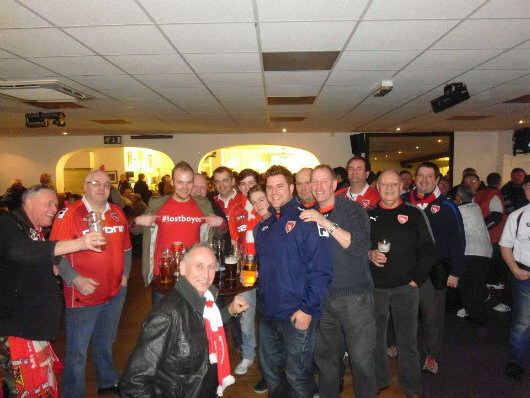 Anyone who has spent any time with me over the past 12 months (or has had the common sense to follow me on Twitter) will have heard me regularly serenade my love of Morecambe FC; this affection purely formed from one random visit to the club’s Globe Arena in November 2012 and the unbelievable welcome I was given – every fan I spoke to that day went out of their way to be friendly and make my day at their club as enjoyable as possible. I still keep in contact with fans of Morecambe. The cult of the groundhopper seems to be ever-growing. Perhaps I’ve only noticed all the groundhopping websites/blogs in recent years as I’ve begun my own, but there really is a brilliant abundance out there these days, from specialists in non-league groundhops to coverage of the European football grounds (I’ve fallen particularly in love with one European groundhopping site: Groundhopping in Belgium – it does make Belgium look a beautiful place to watch football). I love travelling around the UK visiting the nation’s cathedrals of football, but I found myself craving a new adventure recently; I want to do something new – I wanted to hit the continent. If I needed anymore encouragement, it would be this season that Swansea City would win their first ever major trophy, the 2013 League Cup, and with that secure a place in the Europa League qualifying rounds. As if I needed anymore of an invite? Groundhopping Europe was on! Sadly, my profession (I’m an English teacher believe it or not) dictates that after August I will not be able to make any of Swansea’s group games (if they get that far that is) thanks to the fact they are played midweek; however, I’m determined this will not deter me from making ‘non-Swansea City FC’ related trips across the channel and into the heart of continent. Europe: Matthew Harrison of Lost Boyos is coming your way – look out. 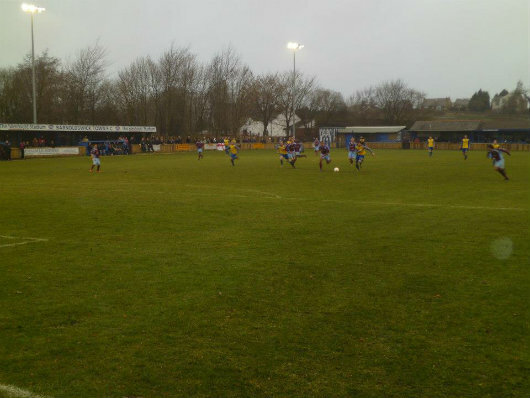 Groundhopping: when else would you have an excuse to visit the delights of Barnoldswick Town’s Silentnight Stadium? For more groundhopping articles, visit the Lost Boyos website. Follow on twitter @LostBoyos.